Went to preview screening last night and was pleasantly amused for the first hour but then it just went downhill. 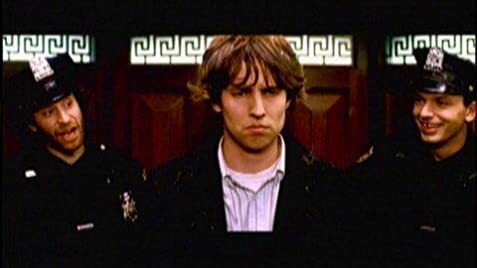 Jon Heder's performance is pretty much flat, not bad in any way except that it does nothing to beyond what was on the page. This is typical of most of the cast who seem to be engaged in some sort of paint by numbers exercise. Even Billy Bob Thorton who is well cast as a drill instructor for losers loses steam. Todd Luiso, best known for the wimpy employee in High Fidelity is probably the only actor that manages to turn in something worthy of appreciation. There is an oneupmanship sequence reminiscent of "Rushmore" but only serves to make one wish they were watching that instead. Wait till it's in the video store and you have trouble agreeing what to rent and need something bland. Ben Stiller's cameo was shot in two days in California because he was unable to fly to New York for filming, due to a scheduling conflict. Dr. P: Every once in a while, a shepherd has to pluck a sheep from the heard and challenge him. It lets the man know he's worthy of leading him. Roger: Well, you know what? I don't want to be a shepherd anymore! Incorrectly regarded as an error: The first time Roger and Dr. P are in the museum, there are two elephants in the background. The next time there appears to be only one in the final shot. This is caused by the shift in camera angle. In fact, the head of the elephant on the left is hidden by the stuffed lion. The body of the elephant is still seen, but looks like a large boulder. Home video release include the 'Unrated Ballbuster Edition' which is 8 minutes longer than the theatrical release. There is an alternative ending.That is only available on DVDs. Is Martin Scorsese involved in a movie about The Joker?